Jehu Jones Jr., the first African American Lutheran pastor, was born in Charleston, South Carolina on September 4, 1786 to slave parents, Jehu Sr. and Abigail Jones. Jones’ parents were freed in 1798. The elder Jones, who had been trained as a tailor, was able to buy a house and take up innkeeping, eventually running an upscale hotel in Charleston with his wife. Jones was originally affiliated with the Episcopal Church but, finding himself increasingly drawn to Lutheranism, around 1820 he became a member of St. John’s Lutheran Church in Charleston. With the encouragement of his pastor, the Reverend John Bachman, Jones traveled to New York to be ordained by the New York Synod in 1832 as a missionary to Liberia to help the freed slaves in that country. However, when Jones returned to Charleston after being ordained, he was briefly jailed for violating a law prohibiting freed blacks from returning to a state they had left. After his release Jones moved to Philadelphia, Pennsylvania, and in June 1833 the Pennsylvania ministry decided that he should be appointed “to labor as a Missionary… among the colored people in Philadelphia under the direction of our Ministers.” On February 16, 1834 the St. Paul’s congregation that Jones founded decided to build a church with the help of other Lutheran congregations. Four months later Jones purchased two lots on 150 S. Quince Street for the church to be built. Assisted by Pastors Philip Mayer of Philadelphia and Benjamin Keller of St. Michael’s Church in Germantown, Jones laid the cornerstone for the building. Jones also founded Lutheran churches in Gettysburg and Chambersburg, Pennsylvania, but those were not exclusively black congregations. 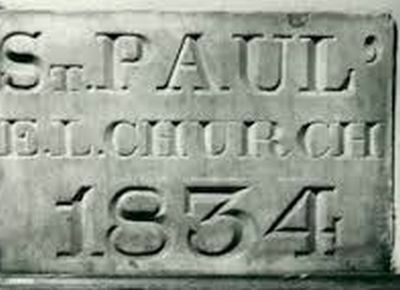 The first congregation of St. Paul’s Lutheran Church was composed of twenty impoverished black Philadelphians. Nonetheless, by the time the church edifice was dedicated in 1836 they and other supporters paid off over $1,000, or 40 per cent of the expenses. The community and religious leaders promised to pay off the remaining $1,300 two years later if Reverend Jones and the congregation relinquished ownership of the church to them. Jones agreed to the arrangement and continued as pastor, but the new owners never paid the remaining balance. To try to prevent foreclosure Jones organized a rummage sale to pay off the church debt. Unfortunately, the owner of the store where the sale was supposed to be held backed out, and in 1839 St. Paul’s Church was sold at a sheriff’s auction. Jones continued to lead his congregation, holding Sunday services at Benezet Hall on Seventh Street. He organized a convention in 1845 at Philadelphia’s Temperance Hall, urging listeners to petition city authorities for black civil rights. Jones also involved himself in organizations dedicated to improving the living conditions among Philadelphia’s African Americans. Jones tried to start a Lutheran church in New York City in 1849, but the New York Synod of the Evangelical Lutheran Church barred him from doing so because of what they charged as the mismanagement of finances at St. Paul’s Church. Jones responded in a pamphlet arguing that the unpaid debts were beyond his control because of racial prejudice against the congregation. Reverend Jehu Jones Jr. died at age 66 in 1852. St. Paul’s Church survived only a few years after his death.